A total guide to manufacturing, retail, and entrepreneurial successin one of today's most lucrative food industries. Here is your one-stop guide to one of the fastest growingsectors of the food industry, where opportunities abound formanufacturers, retailers, and entrepreneurs. Ice Cream and FrozenDesserts is the only complete handbook on the commercial productionand marketing of ice cream and frozen desserts for manufacturingand retail operations. It serves up a feast of how-to information,from writing business plans to purchasing equipment, from selectinga location to marketing your product--it even includes 500delectable recipes using either the continuous or batch method ofproduction. * Select the kind of frozen dessert business that's right foryou. * Plan, finance, start, and operate a manufacturing or retailfrozendessert business. * Purchase, install, and use ice cream making and servingequipment. * Determine which production method is right foryou--continuous or batch. * Market and merchandise your frozen confections. * Manage employees, keep accurate financial records, and maintainsanitary conditions. * Create dozens of delectable types and flavors of frozendesserts. 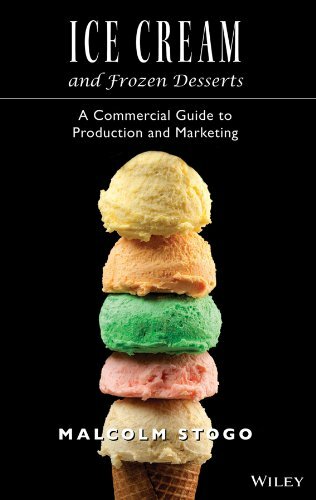 This book is an easy-to-read guide written for manufacturers, either large or small, involved in the production and marketing of ice cream and other frozen desserts. It covers all commercial aspects of ice cream production, such as batch freezing and continuous freezing to marketing and merchandising. This guide includes the largest source of recipes compiled. MALCOLM STOGO is an international food and dairy consultant who has helped leading foodservice, bakery, candy, and ice cream chains around the world successfully develop, market, and merchandise new products.